Each day we are taught by the Source (God) to remain humble at all times. 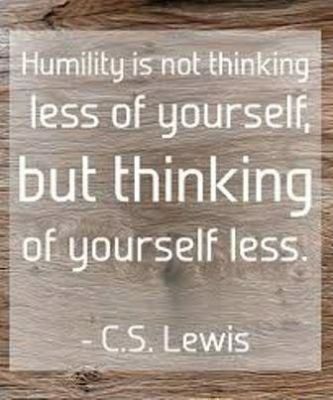 Humility is the great teacher. Life is in constant change. We are a people in progress for we are never done even when we leave our earthly bodies. We will continue on our spiritual journey. Our spirit never dies; it continues its journey of learning and growing. We are on a spiritual journey that started when the Source of life sent us on our journey. We are being taught that “the last shall be first and the first last.” If we live in the ego we become stagnant and stuck. If we are in the spirit we are open to grow and learn from others. That’s why the secret of life is service to others. In serving we discover who we are from those we serve. We cannot live in isolation. We are part of a big world and to isolate and hide is to choose to die while we are still alive. Today I consider myself the luckiest man on the face of the earth. Each day I have the privilege to meet so many people who are on their journeys. Their struggles remind me to never forget my own struggles. In serving others I am reminded that I’m still in the process of learning. I thank God every day for all I’ve been given. We are told that the sage puts himself last so he can be open to what’s ahead. Always give to others and you will receive a hundredfold in return. Success is not in riches or possessions. It is found when you share your talents with others. Serving the needs of others will allow all of your needs to be fulfilled. God created us to be people of service. God made us to be people of hope in this dysfunctional world. When you are able to balance your own personal growth with doing service to others you are at that moment closest to the Creator. We were taught “whatever you do to the least of my brethren, you do to me.” We are all taught the Golden Rule, “Love your neighbor as you love yourself.” Who is our neighbor? Every person who touches us today is our neighbor. God speaks to us through each and every experience of life. We are a people of different cultures, neighborhoods, religions, and although we are all different we are all equal. In AA we have a beautiful set of traditions that teach the secret of balance and service, especially the second tradition, “There is only one ultimate authority, a God as we understand God, and the rest of us are simply servants.” If we live in the spirit of service to others, others will be of service to us. Isn’t it wonderful how diverse we are as a people? We are like a huge mosaic in process of being formed. We are taught every day that all things in life are earned through struggle. Sometimes when you feel down, have faith and don’t be afraid of losing material things. They are not important. To be rich is to be humble and opens us in a spirit of gratitude. To be rich is to be generous to others. We are servants, teachers, and pupils each day of our lives. April showers bring May flowers just as struggle makes us stronger. Enjoy the beginning of spring in the spirit of service and growth. Resurrection means to come alive again. Let’s leave the darkness and walk into the light. May God bless us in all that we do!